Goodbye Venice, goodbye Ravenna, goodbye Ferrara, goodbye Carthage? As hurricane follows hurricane, townscapes burn, glaciers and ice-caps melt and sea-level rises, the effects of climate change are becoming obvious to nearly everyone except President Donald Trump and his followers. Now, the impact this will have on man-made heritage is becoming clearer. A study conducted by Kiel University in Germany, published online by Nature, the peer-reviewed, multi-disciplinary journal for science, shows how the projected sea-level rise for the Mediterranean may affect the 49 Unesco World Heritage sites (WHS) situated at 10m or less above sea level. The most threatened are on the coast of the northern Adriatic: Venice and the Venetian fortifications; the early Christian town of Aquileia, the late Roman imperial complex of Ravenna with its Byzantine mosaics, and the Renaissance city of Ferrara with the delta of the river Po. The next highest risk area is the Dalmatian coast, with the episcopal complex of Porec, and the Tunisian coast, with the medina of Tunis, and the archaeological sites of Carthage and Sabratha. The map reveals the degree of threat to one evocative name after another: the Amalfi coast, the Roman city of Arles, the Greek temples at Paestum south of Naples, the crusader city of Acre, the ancient shrine of Ephesus, even the Modernist architecture of Tel Aviv. The authors have modelled in greater detail than any previous research (see methodology, below) what would happen at the 49 locations by 2100 under four possible sea-level rise scenarios, with the third and fourth scenarios the most likely. It reveals that 37 of the 49 sites are already at risk of flooding, and 42 of coastal erosion, which is because ancient civilisations are often built on water and most of the WHS are of ancient origin. According to the study, the highest number of these sites at risk is in Italy (14), followed by Croatia (seven) and Greece (four). In most cases, the projections have relevance also to the areas around the sites, so the prospect is even more worrying than the report conveys. For example, almost the whole of the Aegean coast of Turkey with its numerous important Hellenistic sites is in the higher risk range, although the Turkish government has not sought WHS status for them. The question is, what can be done to protect these sites? As the report points out, the basilicas of Ravenna could, in theory, be moved from their location, as were the temples of Abu Simbel in Egypt, but cities such as Ferrara and archaeological sites cannot be relocated. At best, this is going to be a case of damage limitation. The first steps must be for the various governments responsible to be made aware of the problem and to add it to their regular agenda. Mechtild Rössler, the director of the World Heritage Centre at Unesco’s head office, says that it is adding climate change to its guidance manual for WHS when it is drawing up its obligatory management plans, which, in theory, are binding on governments. The conversion of knowledge into effective action is, however, a lengthy and fraught process, as shown by the long-delayed and incomplete actions of the Italian government to protect one of the world’s most precious creations, the city of Venice. Venice floods frequently, sometimes to considerable depth, as on 29 October, when the water level reached 156cm above the base rate established in 1871 at the Punta della Salute observatory (flooding begins at 80cm). 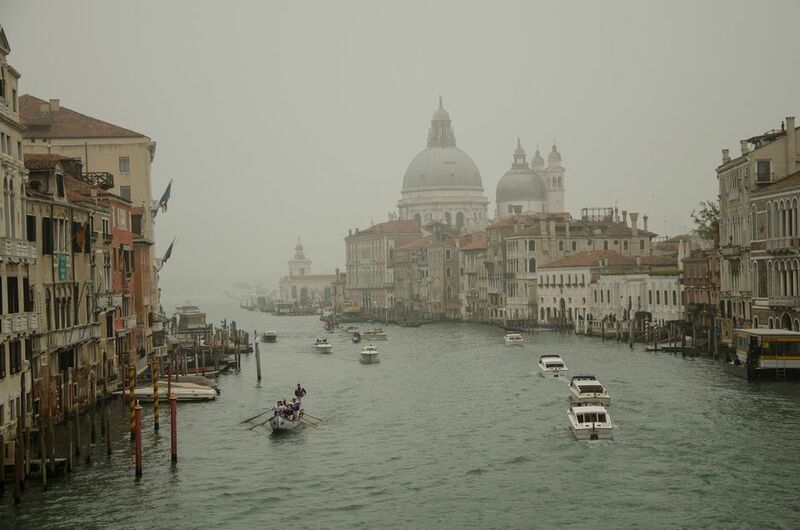 The report in Nature puts Venice in its highest risk category for both erosion and vulnerability to sea-level rise, with storm surges of up to 2.5m projected by 2100. The former is because the lagoon is losing sediment with every low tide into the Adriatic, the latter because the water level in the city is already 30cm higher than it was in 1871. The report says that the city will be protected by mobile barriers (expected to be operational in 2021, ten years late), which are intended to withstand an exceptional flooding event of up to 3m. It omits to say, however, that they cannot save the city from the chronic sea-level rise, which will lead to flooding at every high tide towards the end of the century unless the barriers are kept almost permanently closed, with consequent serious pollution of the lagoon environment. Lena Reimann, a researcher at the University of Kiel and the lead author of the study, says that they first drew the extent of each World Heritage site and modelled its flood plain, principally using Google Earth Satellite imagery. The sites they included are all located 10m or less above mean sea level; some of them, such as Ferrara and Ravenna even below sea level. The researchers collected existing data about past storm surges at each of the sites, taking the year 2000 as their base line. To these figures they added the four sea-level rise scenarios, three of them deriving from the most authoritative body in the field, the Intergovernmental Panel on Climate Change (IPCC). The researchers used the median projections; that is, discounting the high and low figures. The world applies the strictest controls on greenhouse-gas emissions immediately, the temperature increase is limited to 1.5 degrees centigrade and the mean sea-level rise across the Mediterranean region is 36cm. Some control of greenhouse gases, an approximately two-degree rise in temperature and sea-level rise of 47cm. No control of greenhouse gas emissions, a four-degree rise in temperature and sea-level rise of 62cm. This “high-end scenario” includes factors that are still incalculable (which is why the IPCC has not yet reported on it, but respected scientists are already warning of its probability), such as what will happen if the melting of the ice sheets of Greenland and Antarctica accelerates. Here, the sea-level rise has been estimated at above 1.46m. To calculate the risk of erosion, the study takes into account the site’s distance from the coast, the coastal material (for example, whether it is sandy or rocky), the mean wave height and whether the coastline is being renourished with sediment from a river.